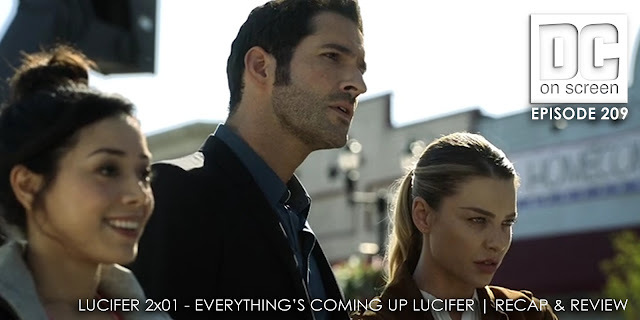 SPOILERS/NSFW - DC on SCREEN #209 - Lucifer 2x01 - Everything's Coming Up Lucifer | Recap & Review - Lucifer wonders where Maze has disappeared to while worrying that his Mother is coming to kill him. After seeing him shot repeatedly and bloodied only to watch Lucifer walk away last season, Chloe repeatedly threatens to have Lucifer’s blood tested to find out the truth about him—before deciding to throw the blood away. Amenadiel, worried about the implications of humanity having proof of divinity tells her Lucifer is putting on a show because of a broken childhood. They, with the help of new medical examiner Ella, solve the murder of a stand-in actress that has a modicum of thematic resemblance to the overarching plot. At the end, the murder is solved, Maze is back (albeit friending it up with Lucifer’s therapist), and Mom shows up injured looking for Lucifer’s help. Oh, and why is Amenadiel’s powers not working? Review us on iTunes to enter our giveaway contest!